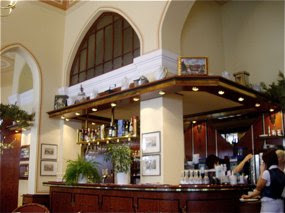 The Café Prag is a traditional restaurant located in downtown Schwerin. It is a decent place to enjoy a piece of cake or a simple lunch or dinner. I enjoyed three small dishes (during two days) there and it was enough to make me completely satisfied. One or two delicious pints of good German beer helped as well. Café Prag is located in Schloss-strasse, with Schloss Schwerin just down the street. Just by you find old charming houses like the rococo building in number 10. Café Prag is just a short walk from the Pfaffenteig and the railway station. Decent service, swift but the waiters were not charming or sociable in any way, but they brought the food quickly, so why bother? 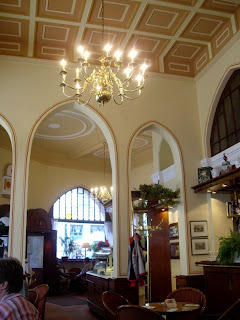 I really liked the interior, traditional in the way you would expect to find in a medium sized German town. Shades of cream and yellow and dark wood. Arched windows and arches in the room flanked by solid columns. The round tables and chairs were located with a good distance to each other, and the atmosphere felt easy and relaxed. If you are looking for white napkins, wine glasses on the tables you have to go elsewhere. You get what you need when you order. 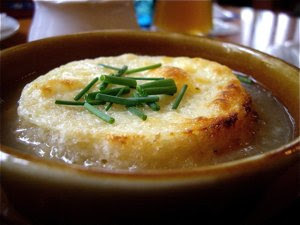 Onion soup is, at its best, a delicious lunch. When arriving at the table, I was intrigued by the presentation. It looked very French, indeed, served in a rustic brown ceramic cup. Brown and glistening, topped with a round piece of bread and golden brown cheese. Sadly the taste was not equally delicious. The cheese was crunchy, all right, but the delicate balance I expected to find in a French Onion soup was not there. It was salt, but adding more would have been a created a more pungent taste balanced with an equal amount of sugar. But where was the sugar? Adding sugar is vital to many dishes, and in an Onion soup it will enforce and enhance the sweetness found in the onions. At the nice price of €3, this soup ended up a little plain. 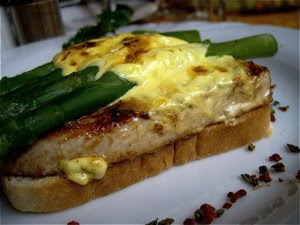 Described as fillet of turkey on toast garnished with fresh asparagus and hollandaise sauce. Sounded seriously yummie. It certainly looked good, and the vital ingredients had an excellent texture. The turkey was succulent and very tender and the asparagus were freshly green and had that reassuring crunch. The sauce could have had a little more lemon and a little more salt would also have been a good idea, but the toast was all in all a decent dish to tuck into. Price: €5,80. This was certainly a dish after my taste. Rich, pink, glistening slices of gravad lax sprinkled with dill weed, served with rich, sweet mustard sauce and a little round piece of crunchy rösti potatoes on the side. This was salt and sweetness in perfect balance and harmony. 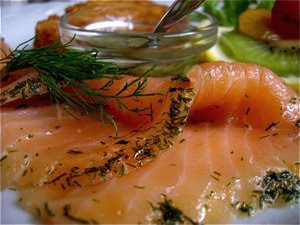 If you should choose something from the menu at Café Prag I would certainly recommend gravlax as the thing to eat. You may order it either as starter at €6,80 or as a main dish at €10,80. And what better to drink for lunch than a pint of weissbier. 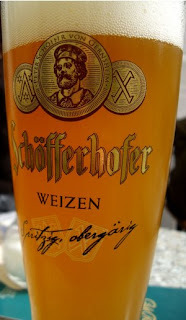 Schöfferhofer Weizen, a fresh amber coloured beer. This beer is bottle conditioned and may have sediments. This is certainly a beer for the warm summer days. Café Prag is a traditional yet informal café / restaurant in downtown Schwerin. Decent food at very nice prices. I recommend the toast of the house and the gravlax.